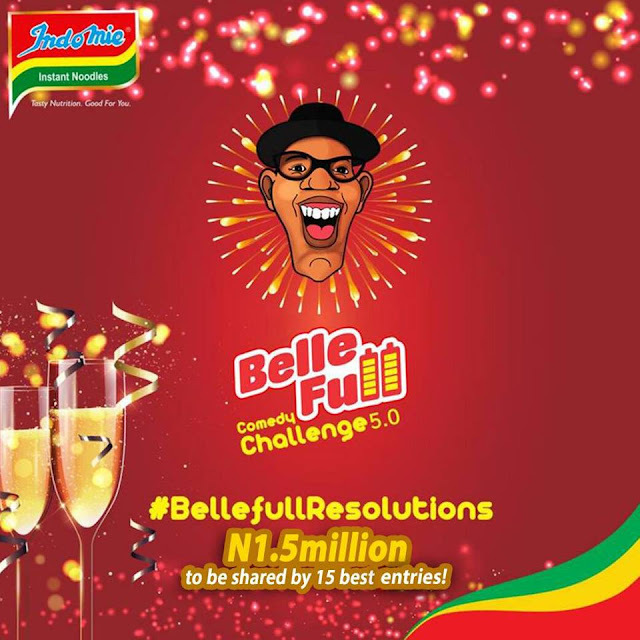 The Indomie #Bellefull Comedy Challenge 5.0 is here, bigger and better with lots of prizes to be won! Get your humour gears on and get rewarded for it. N1.5Million to be shared by 15 best entries!!! 1. Make a funny 60-secs video showing how people make New Year resolutions and break them not long after. 2. 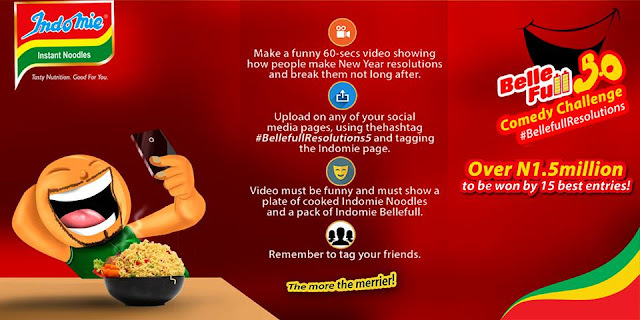 Upload on any of your social media pages, using the hashtag #BellefullResolutions5 and tagging @IndomieNigeria. 3. Video must be funny and must show a plate of cooked Indomie Noodles and a pack of Indomie Bellefull. 4. Remember to tag your friends. The more the merrier! 12 winners of N50,000 each. Entries will be received from the 11th of January 2018 by 9 a.m. Till 2nd of February 2018 by 11:00 p.m. Please read these terms and conditions carefully as they apply to participants in the Indomie #BellefullResolutions5 campaign. If you do not agree to be bound by all of the Terms and Conditions, you are not permitted to join the contest. 1. This contest is open to anyone in Nigeria. 2. You are to upload 60-second comedy video on any social media channel showing how you make and break your new year resolutions using the hashtag #BellefullResolutions5 and tag the brand. 3. Use of wrong hashtag will be disqualified. 4. The campaign starts on the 8th of January 2018 till the 16th of February 2018. 5. Call for entries starts on the 11th of January 2018 to the 2nd of February 2018. 6. All video’s submitted, whether as a winning entry or not, will become the property of Indomie and may be used, published or republished, in whole or in part, royalty-free, in any printed or electronic media and in promotional material, including recruitment and online publications. By sending your Video in for consideration, you provide Indomie with exclusive ownership of your video. 7. Any declaration or announcement of Winners by Indomie shall be final and uncontested.